Wood-sorrel is a member of the big Oxalis family, known throughout the world as an edible wild plant. 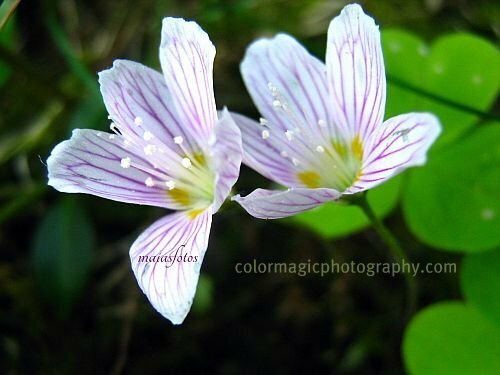 Common Wood-sorrel - Oxalis acetosella, is an Eurasian plant that blooms in early spring, having small white flowers with pink-purplish streaks. Its heart-shaped leaves have three leaflets, similar to those of clovers. Both leaves and wood-sorrel flowers contain oxalic acid and have a sour taste. Children like to chew these leaves. Have a great day, Maia.